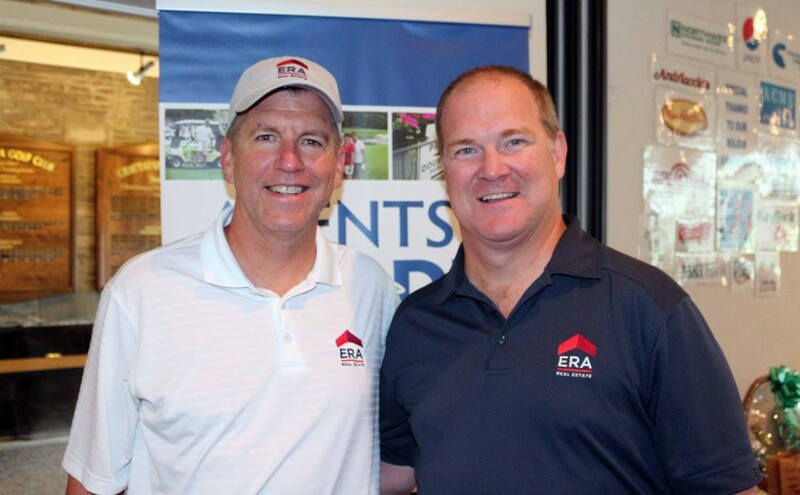 Charlie Young, President & CEO of ERA Franchise Systems joins Bill Soffel, Broker/Owner of ERA Team VP for this year’s Agent of Hope Golf Tournament held on August 26, 2015. 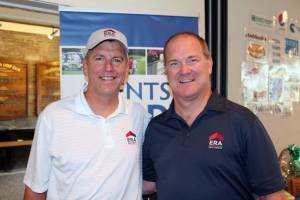 112 Golfers participated in the 6th Annual Agents of Hope Scramble Golf Tournament, hosted by ERA Team VP Real Estate & Vacation Rentals, to benefit the ALS Association and the ALS Division of MDA this past August at the Chautauqua Golf Club. The event, held every year on the last Wednesday of August, raised a total of $9,000. Along with sponsorship opportunities there were many ways for the golfers to help raise money the day of the tournament. Featured on-course events included a Mojito Bar, Jell-O shot hole, betting hole, Arnold Palmer/John Daily Bar, Corn-Hole contest, and a prize wheel. Following the event, ERA hosted a steak dinner catered by Andriaccios, and included announcement of the tournament winners, a 50/50 drawing, and a raffle of over 65 items and gift certificates donated by local businesses. “We’re delighted to host this friendly competition every year in order to show our company’s and our community’s true cooperation in supporting the efforts of the ALS Association and the ALS Division of MDA. Both organizations lead the fight to cure and treat ALS through global cutting-edge research, and empower people with Lou Gehrig ’s disease and their families to live fuller lives by providing them with compassionate care and support,” said Bill Soffel, Broker/Owner of ERA Team VP. Soffel added that community members interested in attending, playing or helping out in next year’s tournament can contact Hanna Soffel Briggs at 716-789-2600 or Hanna.Briggs@ERA.com. “The Agents of Hope Golf Tournament Committee would like to thank Troy Moss, the Chautauqua Golf Club, Andriaccio’s Restaurant and the many generous sponsors for helping to make this year’s tournament a success. A special thanks to the major tournament sponsors: Summit Wealth Financial, Inc., Jenn’s Lake Services, M&T Bank, and Allied Alarm. ERA Team VP looks forward to continuing the tournament next year and for many more years to come,” said Hanna Soffel Briggs, Agents of Hope Chairperson. For more information about ERA Team VP Real Estate & Vacation Rentals in the Southern Tier of Western New York call (716) 789-2600.